You've seen Cloth Baby who did a giveaway for Merry Fluffy Christmas. She also sent me an item to review and we agreed to do it in January since my baby would be here! Well here it is! She sent me the Papoose diaper with charcoal bamboo inner for review. It's meant for 0-15 months and it's smaller than the average OS diaper. It has a pretty neat insert with it. He needed it on the tightest setting and it pulled kind of funny, but it fit great. Fits nice and tight around legs and it's fairly trim. The part that looks a little funny there on the bottom of his thigh is just the inner poking out. I tucked it in after the picture. It truly is a good fit. Despite looking wonky when I first put it on. It fits his thighs tight. We have NO leaks with this diaper at all. It has a hidden layer of PUL and the outside is a great t-shirt material. It's 70% bamboo and 30% cotton on the outside. 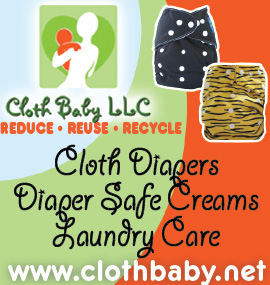 The inner is Bamboo Charcoal, no stains with this diaper which is WONDERFUL! The insert is 5 layers of bamboo insert, 2 layers of bamboo cotton and 3 layers of microfiber. But it is still VERY trim. Yet super absorbent. He's worn this diaper twice now. The first time it was pretty soaked in no time (still no leaks), the second time it lasted a little longer. So even though I prepped it, I think it's still getting more absorbent with each wash. He is a super soaker though. He'll hold it for 1.5-2 hours and then let it all go! The Wipes Solution is Witch Hazel, Jojoba Oil, Grapefruit Seed Extract and a blend of essential oils. It smells so good. There is no water in the solution so you take about 10 drops per 1cup of water! Price: The Diaper is $10!! YES, Just $10!! The solution which comes with 2 free wipes is $8! This will last a long time!